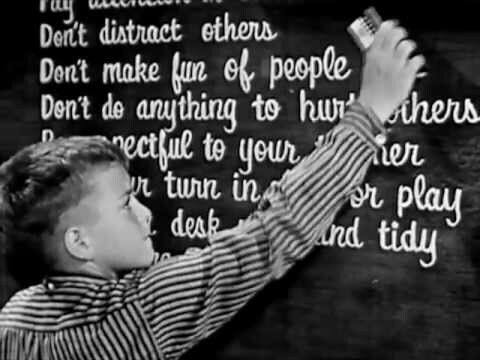 There are so many wonderful things about life today but we thought it would be fun to reminisce a little bit about some of the rules for children’s behavior that were hard and fast rules in the 1950’s. Remember that parents in the fifties had lived through at least one world war and they firmly believed in discipline and strict rules. Here are 10 “Rules for Children” that we miss a little. Kids in the 50’s knew better than to interrupt. They waited until they were spoken to before responding. Otherwise they were expected to sit politely and listen. Today, we often grab meals on the go, eat in front of the tv, or eat at different times. In the 1950’s everyone dressed for dinner and sat together as a family. Children would never be allowed to wear sweatpants to the family dinner table. Please and Thank You were mandatory phrases and children would never say “I want”, instead they would say “Please, may I have” or “I would like”. And if the answer was no, they were expected to accept that answer without any arguments.. When any adult entered the room children were expected to stand and greet their guest with a handshake and an introduction if they were meeting for the first time. All children learned at a very young age that they should NEVER eat with their fingers or put your elbows on the table. Children were expected to write hand-written thank you notes for gifts they received and parties they were invited to. Children practiced handwriting from a very young age so that they would be able to write personal thank you notes. Children were expected to help around the house and the chores included dusting, vacuuming, taking the trash out, doing the dishes, lawn work and more. They didn’t get rewarded for doing chores – it was simply expected. Children of the Fifties referred to all adults – parents, teachers, and strangers – as sir or ma’am. It was a sign of respect and was strictly enforced.